Preserved lemons are an essential ingredient in Moroccan kitchens, where they're used to enhance many traditional dishes, from tagines to salads, both as a garnish and as a key ingredient. Traditionally they are made with two simple ingredients—lemon and coarse kosher salt—with the salt acting as a curing and preserving agent. For those who don't live in Morocco, you can certainly buy preserved lemons online. But they are so easy and inexpensive to make yourself, why not give it a try? Moroccan preserved lemons have a unique pickled taste that cannot be replicated by simply adding freshly squeezed lemon juice. To preserve five lemons, you’ll need 1/4 to a 1/2 cup of the salt and the juice of two lemons. You’ll also need a sterile glass jar that is just large enough to accommodate the lemons as well as a sharp knife. You can prepare the lemons in 10 minutes or less, but the longer the lemons are left to age, the more intense the flavor. If you're in Morocco, try to select doqq or boussera lemons, which are sold as citron beldi. Outside of Morocco, Eureka or Meyer lemons are favored for preserving, but truly any variety will work. The preparation method is a little different depending on the variety of lemon. If you're using the small Moroccan doqq or boussera lemons, remove the stems, make an incision or two near the top of the lemon, but otherwise leave the lemons whole. If you're using any other variety of lemon, remove the stems and cut off the tips. Cut each lemon lengthwise into quarters, but be very careful not cut all the way through—about three-quarters of the way down is enough. This way the quarters should still be attached at the base. The next step is to pack the lemons with salt and stuff them into the jar. Again, the method varies depending on the variety of lemon. Moroccan doqq and boussera lemons which have been left intact need only to be placed in the jar with ample additions of salt layered between each lemon. If you've partially quartered the lemons, pack the crevices with lots of kosher salt, close the lemons and place them in the jar. Make sure the lemons are packed in tightly so that they can't move freely. Compress the lemons as you add them to the jar to squeeze them in and release their juices. Add enough fresh lemon juice to cover the lemons as well as a generous sprinkling of the salt. Cover the lemons tightly and set aside in a cool, dark place. A cupboard or food pantry is fine. Every two or three days, open the jar and compress the lemons to release more juices. If you have room to add another lemon, do so. The idea here is that tightly packed lemons won't be able to rise to the surface. Do this for the first week, or until the jar is packed as full as possible and the lemons stay submerged in juice. At this point, you now want to leave the lemons undisturbed. The lemons will be preserved and ready to use in about four to five weeks, once the rinds are very soft. You can continue to preserve them longer if you like, up to a year or more. Once opened, transfer the jar to the refrigerator, where the preserved lemons should keep well for several months. Rinse the lemons before using to remove excess salt and any film that may have formed in the liquid. Use the rind, finely chopped, in salads. In tagines, stews, and sauces, remove the seeds and use the quarters, with or without flesh. Leaving the flesh will impart a stronger lemon flavor. 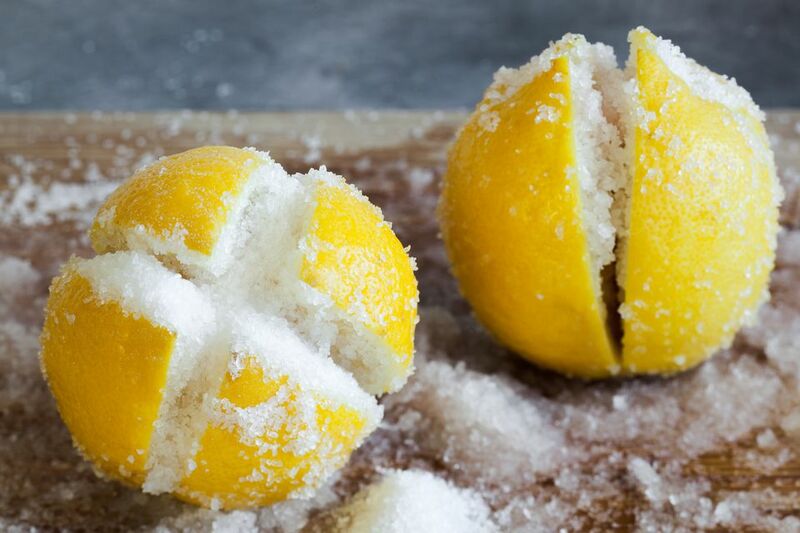 Remember to watch the salt in recipes which call for preserved lemon, as the lemons will add their own unique saltiness to the dish. What Are the Most Common Methods of Food Preservation?